The moai (giant stones) are believed to have been carved, transported, and erected between 1400AD and 1600AD. 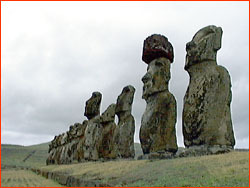 They stand along the Easter Island's southeast coast. The total number of moai on Easter Island is 887.The largest moai is Rano Raraku Quarry, named "El Gigante", the height is 71.93 feet (21.60 meters) and the weight is approximately 145-165 tons (160-182 metric tons).